The Federal Board of Intermediate and Secondary Education BISE Federal Board every year organizes the matric and intermediate exams in Islamabad and linked areas. Matric part 1 and part 2 exams are generally organizes in March while the board conducts intermediate exams of part 1 and part 2 in the month of May. For the year 2019 the board also followed the same schedule and organized matric exams in the month of March 2019. The conduction of annual exams of intermediate was made in May and now board is preparing the results of both levels. The expected date for the announcement of Federal Board Islamabad FBISE Matric Inter Results 2019 is not confirmed yet and hopefully the board will declare the Matric part 1 and part 2 result 2019 in the month of July while inter part 1 and part 2 result 2019 will be declared in August 2019. All the hopefuls who appeared in the final exams could download all the updates of result right after official statement. 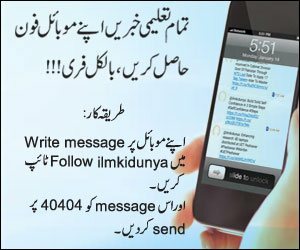 Ilmkidunya every year upload the latest updates of results of both levels soon after the official declaration. So for the year 2019 the result of matric and intermediate will also be uploaded right after the declaration of BISE Federal. The Federal Board of Intermediate and Secondary Education (FBISE) Islamabad was formulated in 1975. The board has authority over many affiliated areas including Islamabad Capital Territory, around the country (cantonments and garrisons), Federally Administered Northern Areas (FANA) and overseas exams. Currently Islamabad board is compiling Federal Board Islamabad FBISE Matric Result 2019 and it will be declared in July and August of matric and intermediate exams respectively. The board also conducts additional exams for the affiliated students. The result of matric and intermediate exams will be declared in the ending dates of July and August respectively. Regular and private students could download all the details of matric and intermediate result at this page as well as the respective result pages. Federal Board Islamabad FBISE Inter Result 2019 will be available right here after the official statement.